I was just about to plant some flowers in a hanging basket I have when I remembered that I have several leftover starter plants that are zucchini, summer squash, lemon cukes, and pickling cukes. I got a crazy idea that if you can put those plants in the ground and trellis them upward, why couldn't you start with them in a basket and have them hang over the edge downward. I realize that once there are veggies on the vines, I might have to sling the veggies in some sort of way. Has anyone ever tried any of these in a hanging basket? If so, do you have any advice for me? Thanks. Many veggies can be grown in hanging baskets. Some people like to refer to this as "minigardening". The best candidates are vegetables with compact or sprawling growth habits like squash, mini peppers, tomatoes, eggplants, runner or pole beans, peas, and cucumbers. Mini, compact, or dwarf varieties tend to work best because the fruits are smaller (and lighter) and less apt to grow too heavy for the plant. You can certainly use up your "full-sized" seeds; just expect to see diminished returns in fruit size and overall production. Strawberries, assorted greens, and a variety of herbs can also be grown successfully in hanging baskets. Alone or mixed in with a few edible flowers (like nasturtiums), a hanging basket full of cascading vegetables is both colorful and practical. Make sure your basket is large enough to accommodate the roots of whatever type of vegetable you decide to grow. Use the deepest, widest baskets you can and fill them with a lightweight potting mix (regular garden soil will be too heavy). Use a soil retention product and solid-style baskets to help prevent the soil from drying out too quickly. Check moisture levels daily-twice a day during extreme heat. Fertilize veggies regularly using a slow release organic fertilizer or compost tea. Baskets should hang in a location that receives at least 6 hours of sun per day. Give baskets a quarter to a half turn once each week to encourage even growth. Avoid hanging your baskets too high. Remember you will need to access them daily. Being "handicapped" with fibromyalgia and arthritis, I've had to adapt to many changes in life-style. You can definitely plant veggies in pots successfully! I've grown peas, kohlrabi, peppers, tomatoes, cucumbers, and watermelons. The melons did not get really large, but were yummy anyway. The best parts are, no major digging or weeding on your hands and knees. I did use powdered miracle grow about once a week and made sure to water everything A LITTLE every day (if it didn't rain). At the end of the season, just pull out the dead leftover plant, and you're ready to go for next year. If a container seems too deep or just to lighten the pots, instead of drilling holes that mud can leak out of, put in a few small clean tuna cans, or single serve veggie cans, or I've even used plastic soda bottles - less soil needed too. I think that the zucchini and summer squash plants would be too heavy, but vining plants like cucumbers would work well, as would tomatoes, green peppers, greens, lettuce, radish, onions, beets, and the like. Hanging baskets don't have much room for roots, so harvest and size of fruit will be smaller. In the heat of summer, you probably will need to water every day. Once roots dry out, they're damaged, and the plants won't be very healthy. They may still produce, but will be much handicapped by the root damage. I had this happen with cucumbers in 5 gallon buckets. Containers dry out much more quickly than the "good earth." Just be aware of their different needs and you will probably have fun with them. Be sure they have drain holes; put a paper towel or coffee filter in the bottom before the potting soil (never use garden soil in containers). I have this crazy idea that if you use a standard pot w/ a hole at the bottom, and you use a hanging rope. You can put seedlings (tomatoes, peppers, zucchini, cukes, etc.) foliage down through the hole, and fill with fertilizer or dirt. They should grow like that topsy, turvey thing on tv. note: seedlings should be small enough to fit in hole on bottom of pot. Cut a hole big enough to wiggle the plant through and then us a moisture control soil. Cover top part of basket with plastic and remove to water. 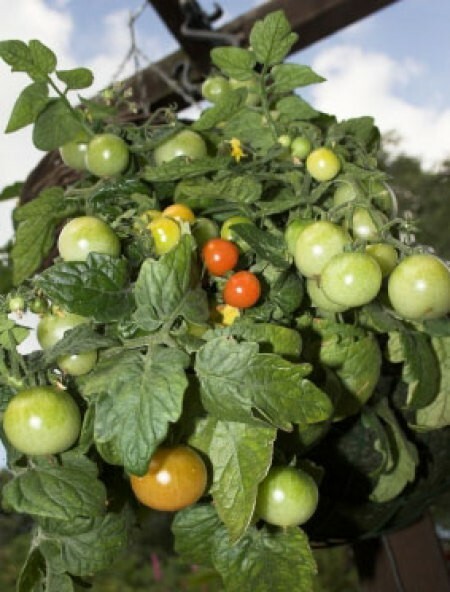 Hang on a shepherd hook with a empty bucket under hanging plant filled with water so if tomatoes fall in it, it will be in the water and tomatoes won't get bruised.